Fortune To Golovkin: Don't Fight a Smaller F***ing Guy - Move Up! Top strength and conditioning coach Justin Fortune, who helps Freddie Roach prepare fighters such as Manny Pacquiao, Viktor Postol, Miguel Cotto, Denis Lebedev and numerous others, believes Gennady Golovkin (35-0, 32KOs) should move up in weight to pursue bigger challenges. Fortune, a former fighter himself, says Golovkin doing him a disservice by continuing to target a fight with Saul 'Caenlo' Alvarez (47-1-1, 33KOs). He views Canelo as a junior middleweight fighter, and says Golovkin should go after another top fighter in his division or move up in weight to take on a bigger man. Golovkin, who holds the WBC/WBA/IBO/IBF middleweight titles, was the mandatory challenger to Canelo [when he was the WBC champion]. Canelo vacated the title a few weeks ago and the sanctioning body named Golovkin as their new champion. Although Canelo vacated the WBC title, there are ongoing discussions for Golovkin to face him the fall. 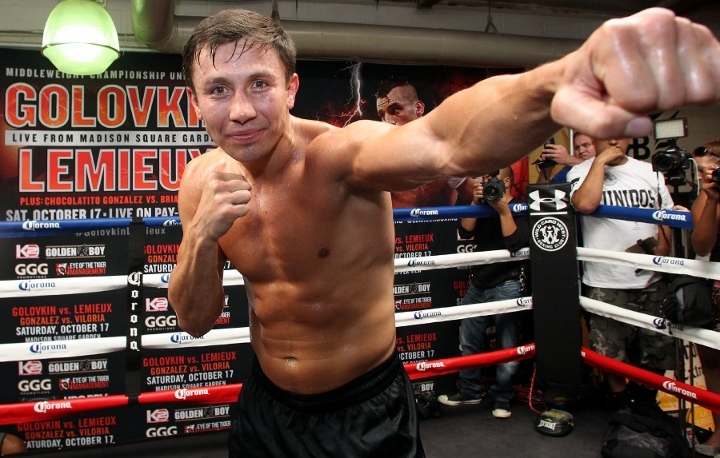 Fortune feels Golovkin should 'dare to be great' by moving up. If he intends to remain in the middleweight ranks, Fortune would like to see him fight Billy Joe Saunders, who holds the WBO middleweight championship. Fortune is not buying the claims that Golvokin is unable to secure top fights. He says there are plenty of fights for Golovkin, especially at higher weights. "Triple G needs Canelo, Canelo doesn't need Triple G. Triple G needs to be a pay-per-view fighter. Canelo is a pay-per-view fighter. Canelo is a 154-pounder, naturally. He just fought Cotto and won that 160 belt, but he's a 154-pounder. You're Triple G, don't fight a smaller f***ing guy, go up and fight a super middleweight, fight a light heavyweight - for Christ's sake go up and prove yourself like they've done throughout history," Fortune told BoxingScene.com. "Nobody goes down and fights smaller guys. Go in a pub and pick on a f***ing little guy, it's the same thing. You want to be a fighter and fight f***ing champions, go up. If there is no one in your division - fight the next guy up, don't fight the next guy down. There is something just terribly wrong with that." "Fight Billy Joe Saunders out of England. He'll fight. Fight Andre Ward at 168. There are plenty of guys out there. If you really want a fight, there are plenty of guys out there who will fight you."